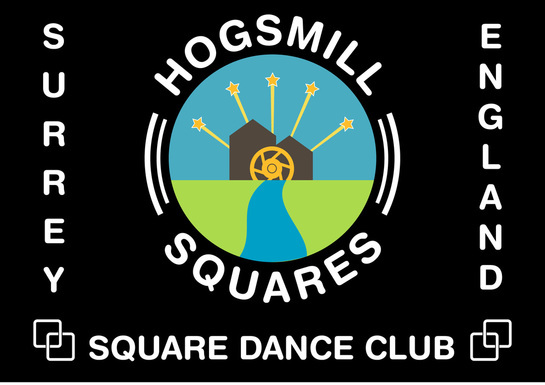 Hogsmill Squares is a Square Dance Club formed in October 2011 when Granville and Wendy Spencer moved into the Worcester Park/Stoneleigh area of South West London. They had been dancing at numerous clubs north of London but found there were none in this area and so decided to start their own. The club takes its name from the Hogsmill River that rises in Ewell and flows through the local area before reaching the Thames at Kingston. The logo reflects the watermills on the river that in the past manufactured gunpowder - unfortunately they had a habit of blowing themselves up! We run two sessions of dancing each week. On a Monday night, for those more experienced dancers, we run a Plus dance evening and then on a Tuesday we run a beginners session followed by a mixed mainstream and Basic session followed by a Mainstream session. Square dancing is suitable for singles and couples and is for all ages. You can spend quality time with your partner or make new friends while learning a new skill and taking gentle exercise. It offers fun, friendship, exercise , co-ordination and dexterity to anyone who would like to have a go. To the general public, square dancing is probably seen as an American pursuit. However, square dancing has its roots in Europe. People from virtually every European country, including England, emigrated to the ‘new land’ during America’s first 200 years. They took with them their customs, languages, skills and their dances. At first, grouped into ethnic concentrations in different parts of the country, the new Americans enjoyed their dances in the pure forms of their homelands. However, as people spread across the land, migrated west and moved from one city to another, the various forms of dance became more and more integrated. In the 1940’s the American forces brought square dancing back to its roots. This caused a great surge of interest in the UK. Its growth was helped by the Queen (then Princess Elizabeth) square dancing during a visit to Canada in the early 1950’s. Today there are more than 130 square dance clubs in the UK and 9,000 world-wide. As all the calls are in English, our dancers can travel the world and square dance. It’s a party – Square dancing is party time every time you do it. Square Dancing brings people together for fun and friendship. The fun starts on the very first night. It’s modern – The music we use is everything from country and western and all-time standards to modern pop. It keeps you fit – Square Dancing is the perfect exercise. It combines all the positive aspects of physical exercise with none of the negative elements. It is low impact activity requiring constant movement and directional changes that keep the body in shape. It keeps you healthy – As with all regular exercise, square dancing can lead to slower heart rate, lower blood pressure and improved cholesterol profile. The movements of many square dances can strengthen your weight-bearing bones. It is a positive alternative to aerobics or jogging when recovering from illness. Above all it is good fun - we laugh a lot, which is the best medicine of all. It burns off calories – During an hour of dancing you can burn between 400 and 800. It’s a mental challenge – Reacting quickly to the square dance caller keeps you mentally on your toes. Whilst concentrating on the moves you escape from your worries and pressures. It’s sociable – Square dancing contains a social component that solitary fitness endeavours do not. It is very tactile and friendly which contributes to self esteem and a positive outlook. Four couples form a square and dance a pattern of moves sung by a caller. As with most activities, lessons are required to learn the basics. Learning the basic steps is easy - experienced square dance callers teach the moves and the names of the calls that are danced. The moves are practised until they feel as natural as walking. The moves are combined into whole dance patterns and are danced to a variety of music. There are more than 130 square dance clubs all over the UK, each one meeting at least once a week, with many opportunities for holidays and weekend events. Square Dancing is popular in many countries, including most of Europe, Japan, Australia, USA. In fact there are over 9,000 clubs worldwide. Learning to square dance opens up a whole new world of fun and friendship as, wherever you travel, the calls are in English.